LONDON, UNITED KINGDOM, March 13, 2019 /EINPresswire.com/ -- SMi Group reports: Senior expert from SCHOTT Pharmaceutical Systems is set to present at Pre-Filled Syringes1 East Coast Conference in just four weeks’ time in Boston, USA. 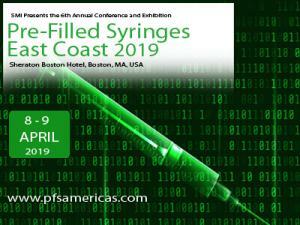 The 6th Annual Pre-Filled Syringes East Coast conference is returning to Boston, USA in April 8th – 9th 2019. The two-day event will bring together specialists within the industry to provide an exclusive insight into the sphere of regulation, new digital technology trends, human studies and innovative design and delivery systems within the pre-filled syringe industry. In the run up to the conference, SMi Group caught up with Patrick Gallagher, Business Development Manager, SCHOTT Pharmaceutical Systems, to discuss his upcoming presentation, and his thoughts on the current challenges and opportunities in the pre-filled syringes field. Q: The Pre-Filled Syringes market has matured greatly over recent years, what key differences have you noticed in the last year regarding significant developments? Q: What do you see as the greatest challenge for you to overcome personally in the pre-filled syringes field at the moment?